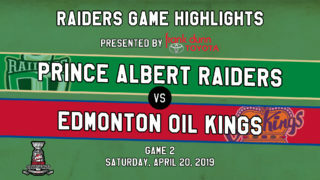 Edmonton, AB – The Prince Albert Raiders (43-7-0-2) picked up a measure of revenge on Monday night by earning a 5-1 victory over the Edmonton Oil Kings (29-16-4-4) at Rogers Place. 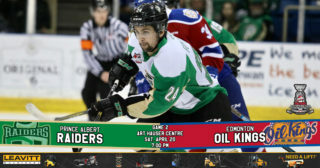 In the last meeting between the two teams on Saturday, the Raiders fell to the Oil Kings at home. Brett Leason picked up a goal and two assists in the win. 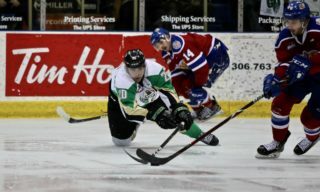 Dante Hannoun, who was playing in his 300th career game, assisted on the Raiders’ first two goals. The Raiders opened the scoring on a late first-period power play after killing off a penalty of their own. Hannoun put a pass towards the front of the net. The puck deflected off Ozzy Wiesblatt’s skate and past Todd Scott with 3:00 to go in the opening period for the rookie’s 11th goal of the season. SCORES! @ozzywiesblatt gets one on the power play! 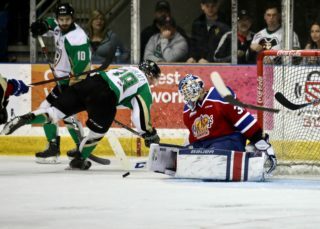 Early in the second, the Oil Kings tied the game on a power play that carried over from the end of the first. Vince Loschiavo pounced on a rebound at the side of the goal and lifted a shot over a sprawling Ian Scott. Four minutes later, the Raiders regained the lead for good. Hannoun drove down the left wing on a Raiders power play. The overager dropped a pass for Parker Kelly who snapped a shot past Todd Scott for his 24th goal of the year. Sean Montgomery, who was playing in his 330th career game to tie a Raiders record, also picked up an assist on the goal. SCORES! @Parks_17 pots one on the power play! Great rush by @hannoun19 to set up the play for his second assist of the game. Midway through the period, Leason doubled the Raiders’ lead. The Calgary product got behind the Oil Kings defence and made a move to his backhand to outwait Todd Scott for his 33rd goal of the year at the 9:13 mark. SCORES! @Bleason7 goes to the backhand to extend our lead! The Raiders kept pressing in the third period. Loeden Schaufler drove down the right wing and put a shot on goal. Jakob Brook was stationed in front of the net and banged home the rebound at the 5:33 mark of the period for his fifth goal of the year and first goal in 32 games. It was also Schaufler’s first point as a member of the Raiders. SCORES! @BrookJakob cleans up the rebound in front of the goal! @L_Schaufler_4 gets his first point as Raider! With 9:07 to play, Cole Fonstad rounded out the scoring. He took a pass from Leason and in one motion spun and fired a shot on net that beat Todd Scott for his 22nd goal of the year, setting a new career high. SCORES! What a pretty goal that was! @ColeFonstad spins and goes backhand! Ian Scott finished the game with 25 saves to pick up his 30th win of the year. Todd Scott stopped 41 Raider attempts in the loss. Of note from the game, defenceman Max Martin suited up in his 200th career WHL contest. Also, Justin Nachbaur served the first game of a three-game suspension assessed following the altercation at the end of Saturday’s game against the Moose Jaw Warriors. 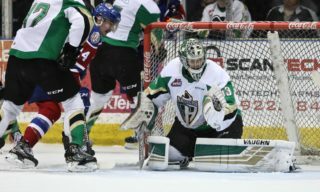 The Raiders are off until Friday night when their Alberta trip takes them to Calgary for a matchup against the Hitmen (26-19-4-1) at the Stampede Corral as part of Calgary’s Corral Series. Game time is 8 p.m. 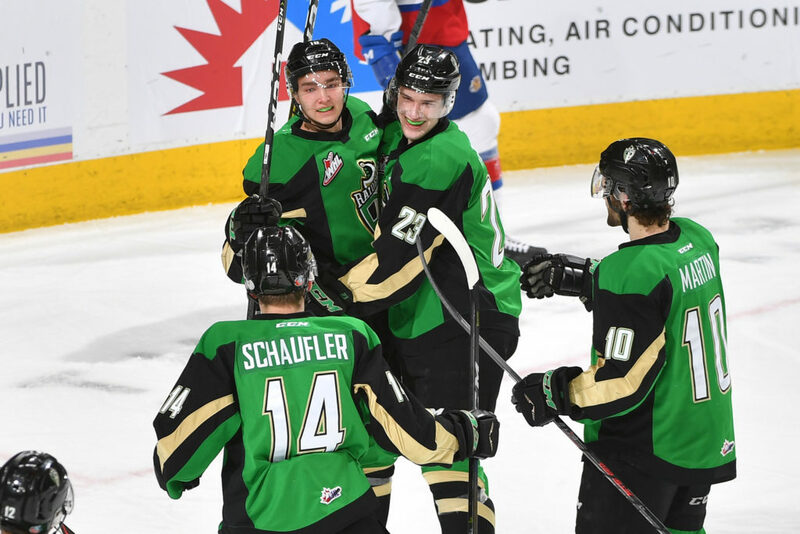 The next Raiders’ home game is Friday, February 15 against the Brandon Wheat Kings. Puck drop 7 p.m. Tickets are available at raiderhockey.com and the Raider Office.